For years, Pittsburg police have used surveillance cameras that display real-time videos on computers to help fight crime. Now, that same footage can also be viewed by officers on the small screen of their smartphones. Pittsburg is the first police agency in Contra Costa County to use the application, which essentially extends existing surveillance capabilities to both Apple and Android smartphones. SAN PABLO -- When drive-by shootings occur in North Richmond, the escape route often is through neighboring San Pablo. Soon, every corridor linking the two areas will be monitored with sophisticated cameras that can home in on license plates and even faces. "This is a cost-effective way to reduce crime," San Pablo police Chief Walt Schuld said. As part of Odin System’s mission to provide superior customer service, we sat down (via phone) with one of our customers, Captain Eric Ghisletta of the Martinez Police Department to see how our most recent security surveillance project in Rankin Park was fairing. “The decision to go with Odin was an easy one for the Martinez Police Department. Odin was by far the most receptive and knowledgeable vendor and worked within our budget to maximize our system. …the Amtrak camera has provided our officers with a fantastic tool to address the drinking in public issues. Prior to the camera installation, we had a big issue with public intoxication and drinking in the Amtrak lot. With the camera, our officers can view the offense from our dispatcher center and respond in a short timeframe to deal with the responsible. We have seen a noticeable decrease with this issue since the cameras have been installed. The quality of our system and of the Odin team is outstanding. I am amazed by the knowledge and creative mindset of Dustin and Cyrus. The visions are only limited by our budget! When the Piedmont Police Department was facing a surge in property crimes and residential burglaries in 2011, they needed a strategy. They developed a road to mitigation that included strategically deploying Automatic License Plate Recognition (ALPR) video surveillance cameras for the primary purpose of assisting detectives in obtaining suspect information. 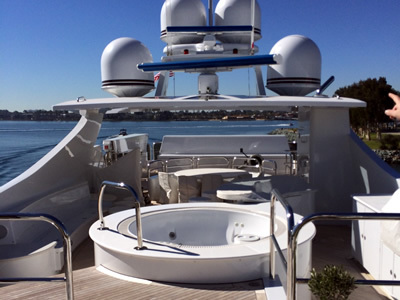 Slung 20 feet in the air at Marine Group Boat Works in San Diego, The Glaze sits patiently as she gets fitted with one of the most custom and high-end video surveillance systems available in the boating world, engineered just for her. Hand-built by Trinity Yachts in 2007, The Glaze fits into the luxury superyacht category at 161 feet bow to stern and with a Jacuzzi, sprawling sun deck, al fresco bar and grill, huge swimming pool, two spiraling staircases, panoramic sky lounge and ability to house 12. 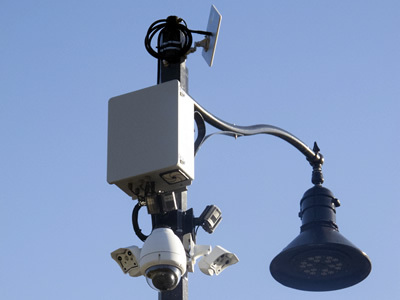 “We choose Odin Systems after an extensive search for a knowledgeable and experienced surveillance system vendor. What most impressed us about Odin Systems is their ability to integrate cameras seamlessly into our secure network and provide an easy interface for our users. Thanks to Odin Systems, our officers can access the cameras in the police department, on their car computer, or on their smart phone. In 2007, a violent sexual assault occurred in our City. Witness descriptions of the suspect vehicle were vague. When officers reviewed video footage from a camera near the crime scene, the suspect’s vehicle was identified. This footage gave us the make, model, and color of the vehicle. We were able to broadcast this description to officers; several days later, an officer saw the vehicle and stopped it, which led to the suspect being identified and arrested. If not for the camera footage, this case would have remained unsolved.